The replication of unbeers as beers continues apace at Moon Dog's HQ in Abbotsford. Hot on the heels of the Bad Boy Bubbly barley champagne and their Bloody Mary replicant comes their most audacious attempt at reimagining another beverage as a beer. 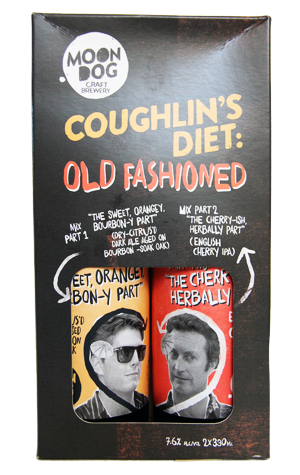 Coughlin's Diet – inspired by Bryan Brown's character in the 1988 "classic" Cocktail – sees them attempt to fashion an Old Fashioned. But they don't merely give you the finished product; they're offering up a two-pack featuring two beers that you blend to end up with a "beer-that-kinda-sorta-tastes-like-an-old-fashioned-ish-drink-of-sorts". In the orange corner, representing Tom Cruise, is "the sweet, orangey, bourbon-y part" which is described as a "dry citrus'd" dark ale aged on bourbon soaked oak. It's a combination of rich, dark malts, bitter marmalade and drying back palateness. In the red corner, representing Mr Brown, is the "cherry-ish, herbally part" in the form of an English IPA with a touch of cherry: a pale golden, light on the palate beer, with the cherry playing a secondary role to its classic English hop characters.